Think, Sketch, Discuss, Model and Act on Dragon1. 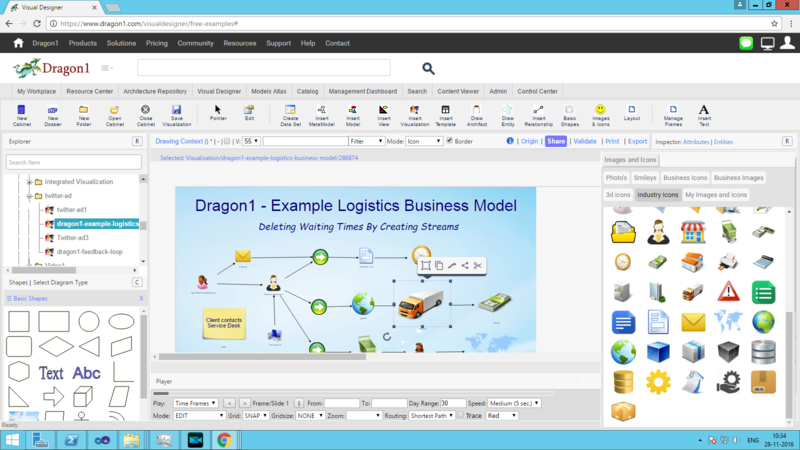 Dragon1 is a business modeling platform. You can design and visualize any business model you like. And next you can communicate, present and manage with it, using all the tools on Dragon1. You can create a business model all by yourself or in a team scattered out over the world. If you can't wait any longer, create a trial account here. Or else read more on this page about business modeling. 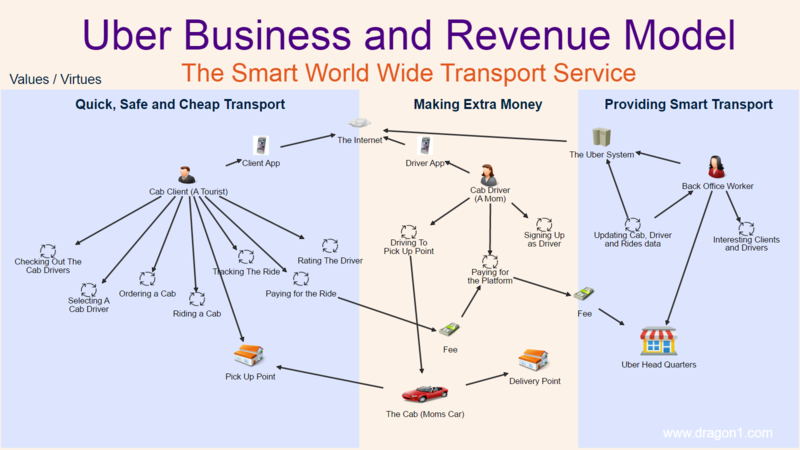 This example business model was created on Dragon1 using the Visual Designer. You can watch a life version of this business model here. Disclaimer: Please note that this diagram was created based on public sources and just present an example. For information about the real business model always contact IKEA. IKEA is a nonprofit company. Its mission in 2013 was: "to offer a wide range of home furnishing items of good design and function, excellent quality and durability, at prices so low that the majority of people can afford to buy them." IKEA is a company with 135,000 employees in 44 countries with $27 billion in annual sales. When IKEA talks about their business model they talk about three things: Our Product Range, Our Low Prices, A better Everyday Life. Their vision and business idea in 2016 is: "At IKEA our vision is to create a better everyday life for the many people. Our business idea supports this vision by offering a wide range of well-designed, functional home furnishing products at prices so low that as many people as possible will be able to afford them.". The question of course is: how do they manage that? What do they do in order to be able to have a product range that appeals to the current needs and interest of the public and how can they make furniture for low prices? A good business model diagram would reveal it. 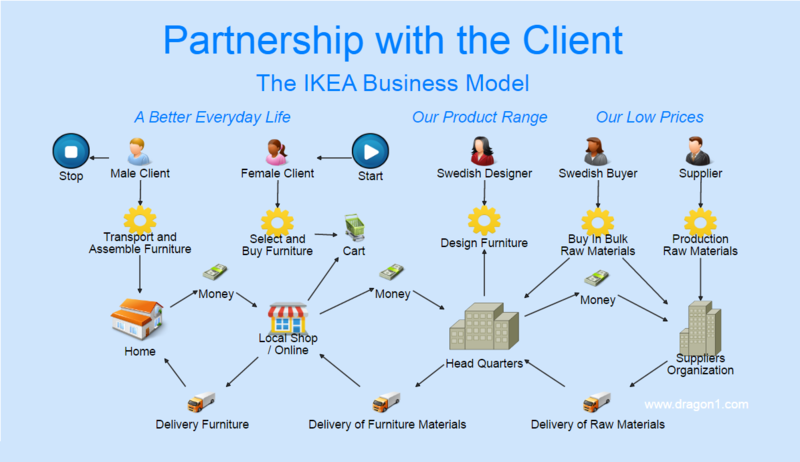 The IKEA business model can be visualized on Dragon1 as seen on the right. Never has Business Modeling been this easy! Often with business models, there is an internal version that holds the real and secret story and there is an external version for marketing purposes: how you want your customers, clients and other stakeholders to see how you do your business in an affordable and sustainable way. Both these versions can be a formal model but also an artist impression, or as we call it on Dragon1: an artistic process model. On Dragon1 you can create artistic business models! And because the business models are good to look at, it will be much easier to communicate them to stakeholders. The functions, activities or processes that are carried out. The roles of people and organizations doing these activities. In the example business model of IKEA these four types are represented. If you stick to these rules, the way how you draw it and what shapes or icons you use is less important. The business model will now only show you what business is done, but also HOW the company is doing business. Below you see an example artistic business model created in the Visual Designer. The business model shows how customers can contact the company by phone and email and depending on the customer's request a different work stream is entered, reducing waiting times in the company and on service delivery. This visualization is of course not a complete or real business model, but a great example on how to visualize your business model in an artistic way. This screenshot shows an artistic business modeling model created on Dragon1. Everyone will have some idea of a new business, triggered by all kinds of new technologies or new and changing needs of customers. Before you can design and visualize any business model, you need to have an idea: we call this the Business Idea. That business idea will be enabled or triggered by your (and other stakeholders') identity, mission and vision. You write down these identities, missions, visions and Business Ideas. You might even have already some idea on how to trade, how goods will flow from producer to consumer (the goods stream) and how value or money will flow back from consumer to producer (the revenue stream). And maybe you now some partners, technologies and other stuff. Write these all down. As you will need this information to create a design your business model. In Dragon1 we talk about Business Architecture, being the total concept of a business. Business means trading goods for value (money). When you say Business Model, it is not clear if you mean Conceptual Business Model, Logical Business Model, Physical Business Model or Implementational Business Model. Why is this important? Well if you create a model with a mix of levels of abstraction, you will introduce innovation blocking solutions, elements and component in your business model without knowing it. The better your keep to one level of abstraction in a model, the better you control the success of innovation and prevent showstoppers. Other approaches in Business Modeling often do not address the conceptual level, but Dragon1 always starts here. Look at your identity, mission, vision and business idea. How would you name the total concept (business architecture) of your business? For example: DronePizzaNow! - 100% online easy to order B2C pizza delivery by drones. This total concept includes and excludes things. This total concept reveals the benefits for the customer and some technologies. Now we have something to work on. Often a business have three major parts: Production, Delivery and Consuming. These are different worlds. The people producing, delivering and consuming all have other needs. Sometimes you can have all these three worlds in one business, like a hospital, and sometimes they are all three separate, like a grocery store. Try to think of your three worlds. What are the key players, roles, places, locations, functions, processes, the partial goods stream and the partial value stream in that world? And what (sub) concepts do you want to use in these worlds: easy online ordering for the consumer and zero waste for the producer and self-employment in the delivery world? You have the say in this, as you are designing your business model. You see that the sky is actually the limit. If you know of concepts you can use them, if you don't, you can't. So be sure to read and watch a lot of business ideas and new technologies. Every concept (like online ordering, zero waste, etc..) has the way it works producing the beneficiary result. In order to be able to really design and implement a concept successfully in your company, you have to know its principle (the way it works). Literature holds that secret on concepts. SO be sure to read a lot about the concepts you use in your design. And if you are confident, you might even change the principle of the concept a bit so it suits you better. Once you have written down the principles per concept, all the nouns and verbs are the elements that need to be implemented. Write them and draw as a model. Elements are logical level parts of a concept or system. You will see that some elements are already in your company and some elements are shared in concepts and some elements may even conflict. These are situations you have to address. Suppose you have the concept of online ordering, you will have to define an element: Intuitive Self Explaining Ordering Application (which of course is also a concept of its own). Now we need to detail the logical elements into physical components. For the Ordering Application, you have to know what components are needed to make it actually Intuitive and Self Explaining. ELse people won't order pizzas. So if you don't know it yourself, fly in an expert. But you need to get the components right! 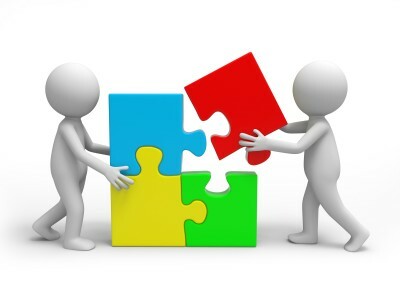 In this step you need to detail per component if there is a supplier with a product that can be mapped onto it. Now you have designed and visualized your business model, you will probably in your mind have some concrete step that should be taken already today or tomorrow. Well, you know the drill: Write them down. Create an implementation and list the elements, component and technical products that need to be implemented in order for the concepts and principles to work. Contact us if you are interested in this approach for Business Modeling. Dragon1 is a specialized tool, training and method for creating your new winning Business Model. The main application you will be using to create artistic business models is the Visual Designer. It is one of the Dragon1 web applications on the platform. Everyone who creates an account and logs in has access to this web application. Anytime, anyplace, anywhere you are, you can use the Visual Designer to create diagrams. And you can publish them in the Content Viewer so they are accessible by stakeholders on any device. Stakeholders can even comment the visualization so you as designer, analyst or architect can improve the business model. This screenshot shows the Visual Designer web application where the artistic business modeling model was created in. Having created a wonderful diagram that no-one takes a look at is a waste of your time. So on Dragon1, you have the unique opportunity to publish your diagrams to the Content Viewer. And on any mobile device thinkable you can watch the diagram. You can publish the diagrams publicly, but also privately, meaning you have to log in to your account before you can access them. In a professional setting in an organization, this is a mandatory feature. Dragon1 supports business modeling in any framework or method. How can that be? Well, you can create metamodels yourself, setup modeling rules (a crud matrix) to go with that metamodel and configure model types, reference or example models and modeling shapes or icons. These five ingredients together form a framework or method. We already setup and configured three standards for you: The Business Model Canvas and Business Model Generation and the Dragon1 Business Modeling Language. You only need to create an account and login in and you are your way. And you can make use of the help pages to guide you in the process of creating a business model. Do need more assistance, if you get a PRO license, you can make use of the service desk. For more information on buying a subscription contact us. Do you also want to create an artistic business model? Purchase a Dragon1 subscription here and login immediately. Read the Help on how to create a business model and start up the Visual Designer to create one yourself AND manage with it.